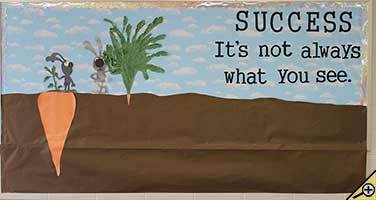 Our Motivation Bulletin Board Ideas page will provide you with great resources for a number of motivation related topics. 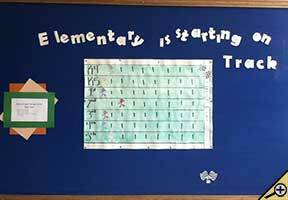 Our bulletin boards will help you integrate various activities into your daily curriculum. 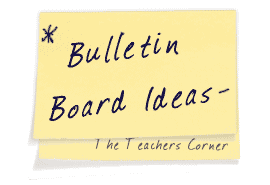 Ideas within the motivation bulletin board pages include resources for the following areas: self-confidence, homework, and behavior. 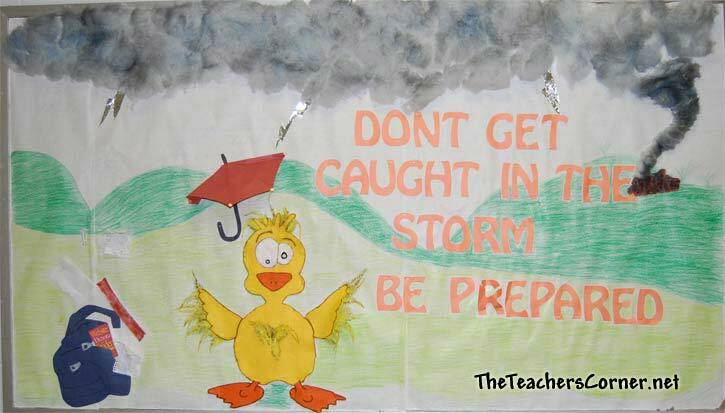 Submitted by: Leanne Wilson, Plainview Middle School. 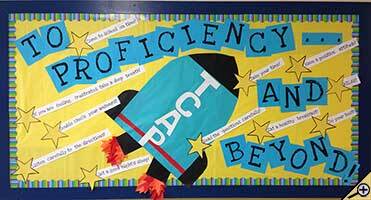 Our guidance counselors at school created this board to promote our statewide standardized test. The used a yellow background. Cut out a rocket and the saying was To Proficiency and Beyond. 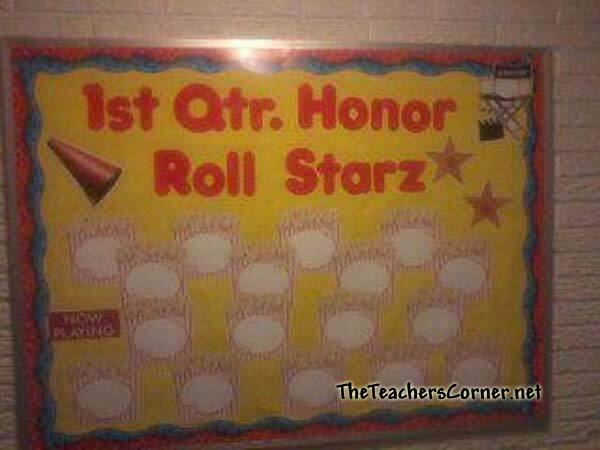 Next to each star is a different test taking tip. 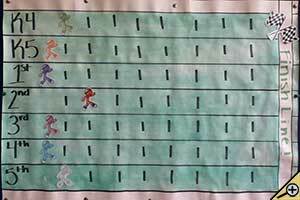 I teach at an International school in China and this bulletin board was very exciting for the students. 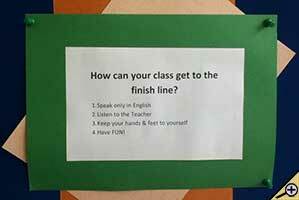 In order to get to the finish line students needed to behave through- out their PE Class. 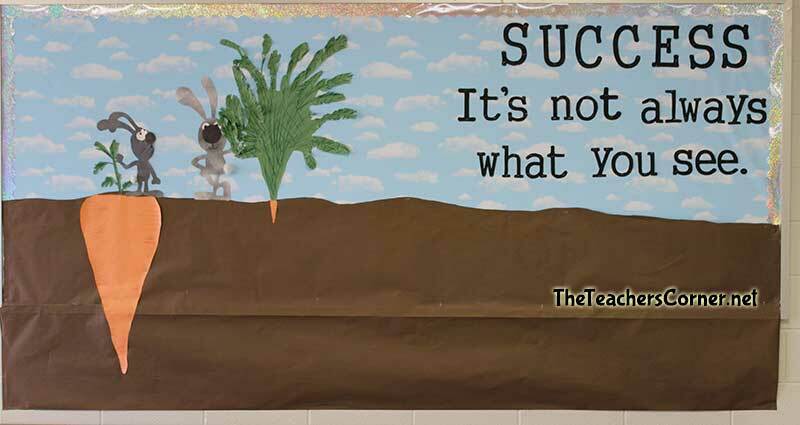 Every day the students would ask me… “Does our “person” get to move?” Great motivation for my students! As time went on I added pictures of each class to the outside boarder of the board! 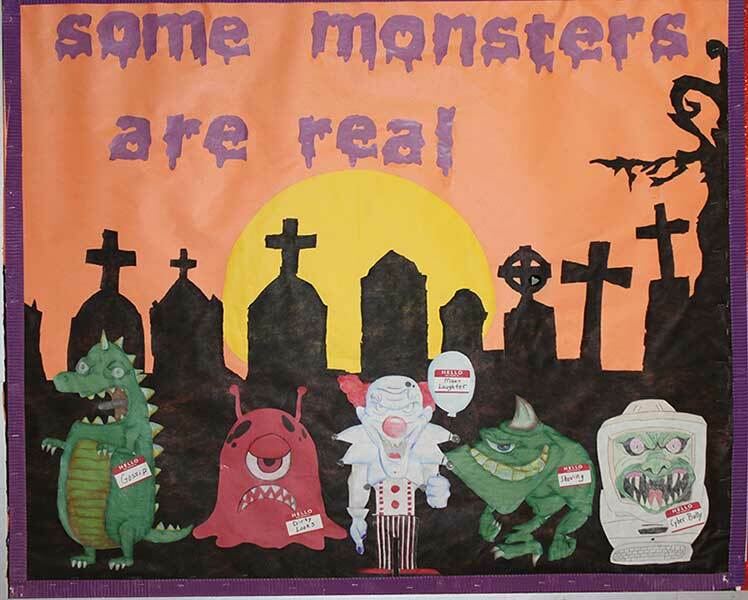 Submitted by: Karen M., Wuhan Yangtze International School, Wuhan China. 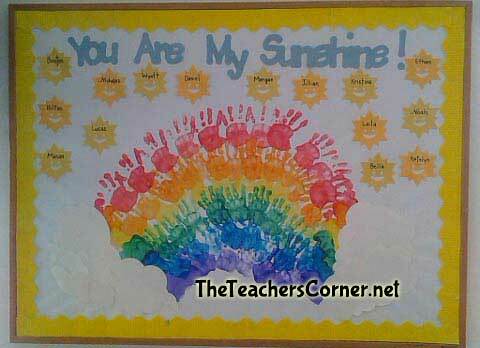 Finger painted handprints in a rainbow surrounded by sun cutouts with student names. "Gossip", "Dirty Looks", "Mean Laughter", "Shoving" and "Cyber Bullying". 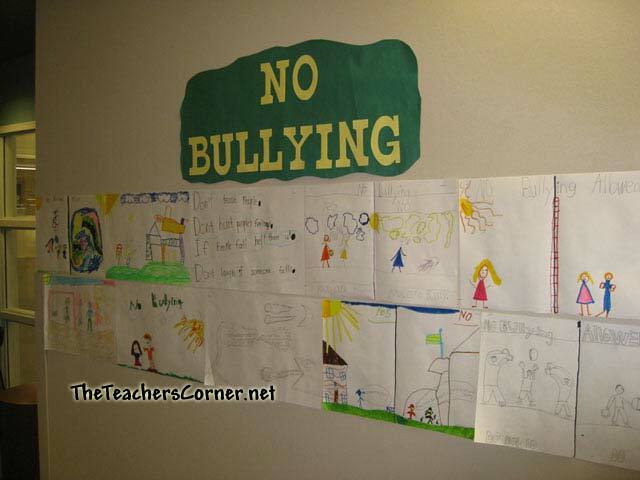 Select an anti-bullying theme to focus on each month of the school year. 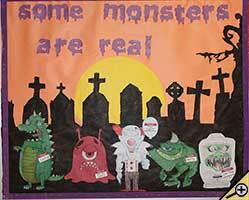 Create digital versions of posters to post on your classroom web site, blog or wiki. 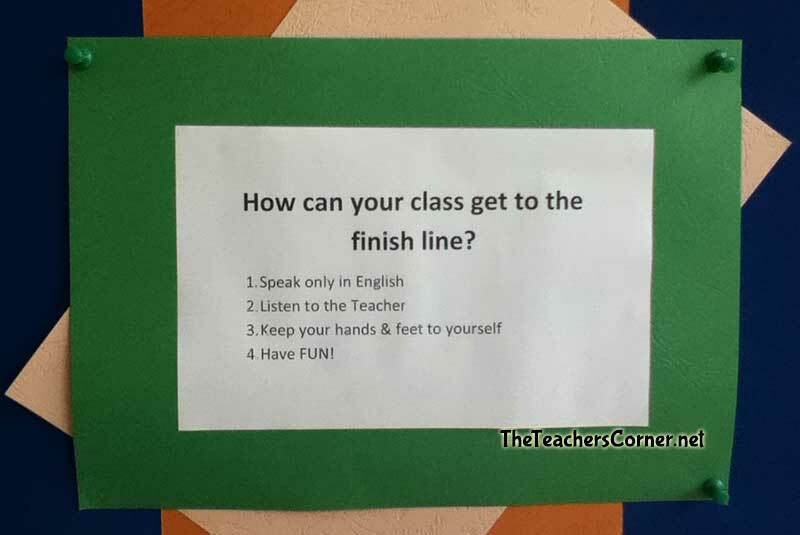 I always have trouble with students wanting to get lazy in the last few weeks of school. 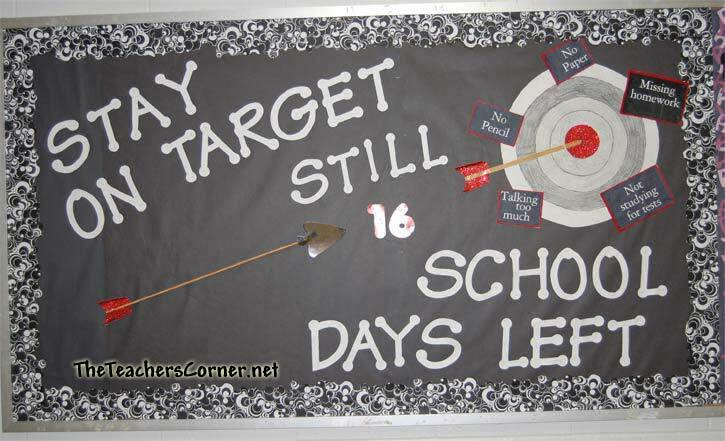 This year I made a countdown board to remind them to stay on target. I put things on the outside edges of the target that were things to avoid. I made the big arrow out of a dowel rod and shiny scrapbook paper. 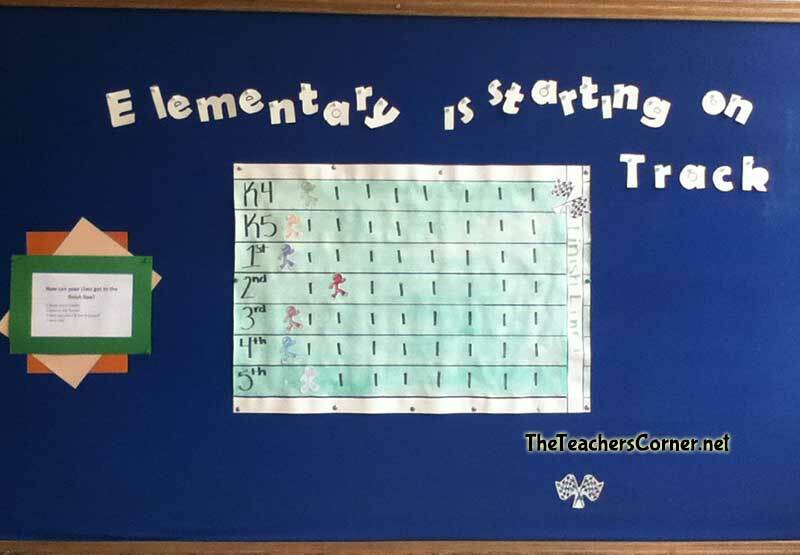 The students love to see the numbers countdown. I just loved this little duck and wanted to make a board where I could use him. I used my computer that is connected to a projector in my room to put the image of the duck up on the board. I then traced it on felt to make it more realistic. I used feathers from the craft store that I colored black at the ends to give them a scorched look. 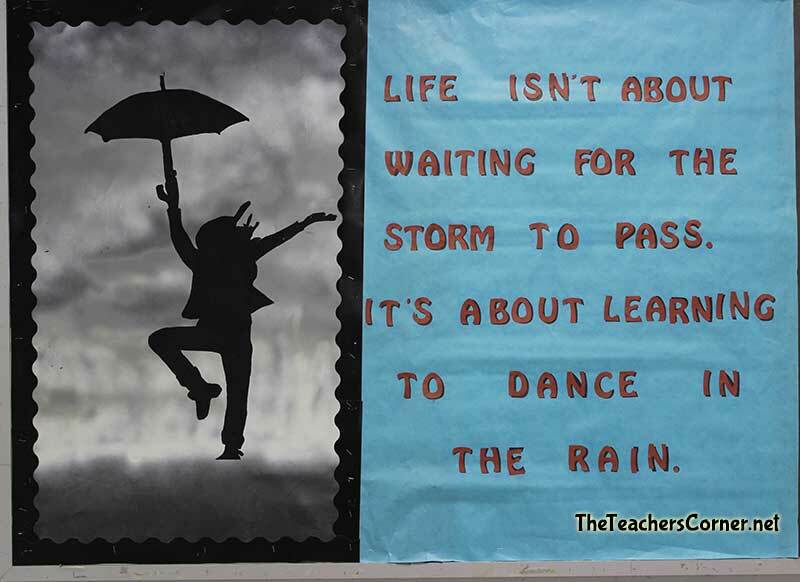 The storm cloud and tornado are made from polyfill and spray painted with black and dark blue. The lightning was made out of tin foil and I used a miniature notebook to create the messy papers coming out of his backpack. I was a little disappointed with how the background came out but the hills are very simple to make. Children spend some time looking in the mirror before drawing a self portrait on shiny silver paper. I use 12x18 sheets, or if I have time I precut ovals to represent a 'Mirror.' After the portrait is fully colored in with oil pastels, I have students design, measure, cut and assemble a frame from construction paper. These framed portraits hang on a bulletin board titled "SELF REFLECTIONS" and below each portrait is a short piece of writing describing what each student defines as their strengths and their goals. Older students write these self reflections during first wee writing time, and younger students dictate to a scribe on the computer. I send out a letter to all the parents of the students in my class that asks the parents to list their child's positives and talents and anything else they wish me to know because "I want to get to know your child better". I then give each child a paper with every child's name in the class on it with enough space to write out next to each name some good things they know about that person/classmate. I then take all information from all sources and put it together along with my own thoughts about the kids on 4 x 5 sheets of paper. I try to write their names in calligraphy and then I put them all on a bulletin board with different colors and shapes on the background of the board. Then at the time of year for yearbooks, I take them and tape them inside the yearbook of that particular child. 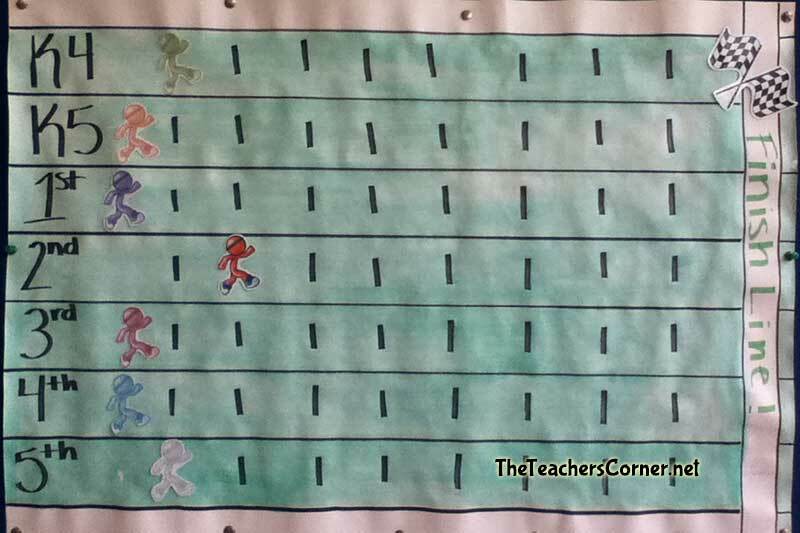 Towards the end of the year my students become unmotivated with classroom homework incentive. So to juice things up a bit the for the last two months of school we use our bulletin board to play Homeworkopoly. The students create game pieces from pom-poms by gluing eyes and feet on. I use the large squares around the board for the game board. 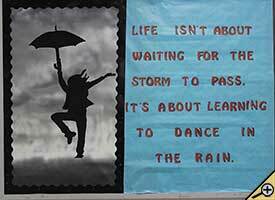 There are a variety of fun squares to land on, like win a no homework pass, eat lunch in the room, eat lunch with the principle etc. Every time a student brings back homework the roll a die to move their marker. It makes homework a lot more exciting and motivating! !